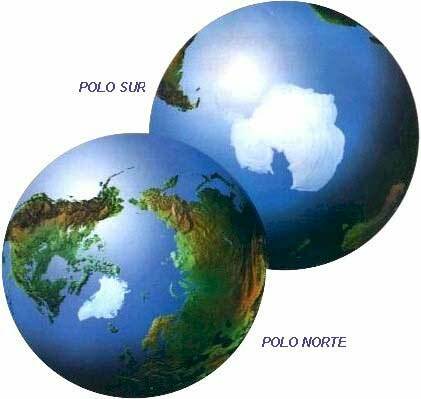 Around both poles of the earth the polar regions extend. The polar caps are limited by the Arctic Circles, to 66º 33 ' of North latitude, and Antarctic, to the same latitude in the South hemisphere. Both regions are mostly covered with ice, product of the winter snow accumulation that does not reach to be fused by the solar light during the summer. The great masses of ice, called icebergs, are characteristic of the polar seas, blocks that to be located on the coasts fall off and begun to float to the drift, until disappear confused with the water of the sea. In the poles, by the Earth position respect to the Sun, the rays lower oblique. Consequently, it does not manage to be totally absorbed by the ground, and a great percentage of the heat is rejected by reflection. The temperatures are very rigorous; in many sites, not even reaching values over zero in summer. The extreme marks that have been registered are of -126 F in the Antarctic, and -58 F in the Arctic. Another characteristic is that in both areas, as is more near to the poles, winters are darker and summers most luminous. In the polar zones, summer and winter last six months, and during the coldest station the sun does not show in the horizon. In its continental sector, the Arctic includes the northern ends of North America (Alaska, Canada and Greenland), Europe (Scandinavian countries) and Asia (Russia). The fact that the colds are not so extreme in the Arctic region must to the fact that most of it, unlike the Antarctic, is occupied by the sea. The oceanic mass of water absorbs the heat better during the long summer. 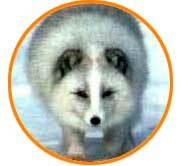 The most known animal in this biome is the polar bear, the greater living carnivore. It can weight even 1760 pounds, and it mainly feeds on seals and fish. When it is not able to catch them, it eats mosses and lichens. Unlike the Arctic, the Antarctic is a true continent, of about 14.000.000 of km2. Hardly 7,600 km2 of that extension are free of ice; the glacial cap has in some sites up to 4 km of thickness. The vegetal life is reduced to lichens and mosses. Nevertheless, there are two species of plants with flowers. Both grow in the Antarctic Peninsula, the end closest to South America, warmer and humid than the rest of the territory. The lichens arise in the naked surfaces of rocks. They are very resistant to the cold and the drought; they obtain water of the fused snow, and nutrients of excrements of birds, transported by the wind. Because of the lack of vegetation, it does not exist terrestrial mammalian. The terrestrial animal of greater size measures 0.5 cm: it is a fly without wings, that in summer lives in the fresh water ponds. There are also tiny crustaceans, along with protozoon and other simple living forms. The penguins are nonflying birds that nest and live in great colonies near the coasts. 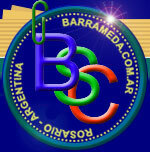 They are clumsy in earth, but very capable swimmers and divers. The emperor penguin is the most beautiful specie and of greater size. Other typical birds of the region are the albatrosses and petreles. They have long and narrow wings that allows them to glide, in a continuous flight on the surface of the sea. They only descend to the water to feed on fish and calamaries or to rest. 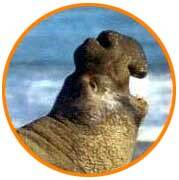 In mainland they settle on rocky protuberances, but only during the period of reproduction. In spite of the cold and the long polar night, species can be found in these regions, like polar bears, seals whales, penguin and others. Six species of seals inhabit the region; in XIX century they have been drastically reduced by huntings, untied to take advantage of his skin and fat. Another typical settler of Antarctic waters is the whale, equally threatened by the indiscriminate capture with industrial aims. The fishing of some of its species has been prohibited, like the blue whale. For others it is only allowed, as in the case of the seals, with scientific aims. In the Antarctic marine bottoms there are great amount of fish, that feed themselves mainly on kril. It is called thus to zooplancton, formed by several species of marine crustaceans. The kril plays an important role in the food web, reason why the excess of its fishing could introduce dangerous modifications in the marine biomes. The Antarctic continent is of great ecological value, because it participates in the regulation of the climate in all the planet, and in the flow of the ocean currents. The risk alteration of an ecosystem of such importance impelled, from the Antarctic Treaty of 1959, the action of many groups of scientists, ecologists and common citizens that proposes to declare the Antarctica ecological reserve of the humanity.